Thumbs Up EP-XP2 is Simple, compact, and effective. Thumbs Up EP-XP2 is specifically fitted to the Fuji X-Pro 2. The Silicone Rubber inserts serve to dampen vibration, provide stable contact with the camera body and better protect the camera. The EP-XP2 Thumbs Up incorporates the well proven 22 degree beveled EP grip. 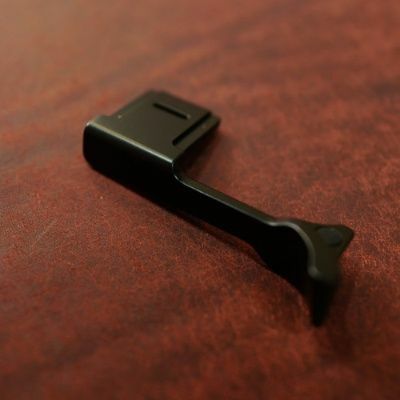 This thumbs rest profile provides a most efficient shape for holding your Fuji camera more securely and more comfortably. The special EP profile substantially reduces grip pressure points and helps reduce camera shake. The Thumbs Up EP-XP2 will provide a natural feel and sense of security. You can easily hold your Fuji X-Pro 2 securely with one hand without accidentally disturbing the position of the Auto Exposure Lock button, or program thumb wheel. The ISO lift up ring is easily accessed from both sides of the camera while maintaining a solid one piece construction from solid brass.